Very Good. In very good packaging. Various Artists-Guardians of the Galaxy: Awesome Mix Vol. 2 by Various Artists. Fine. In fine packaging. 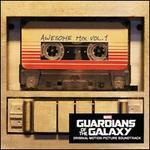 Various Artists-Guardians of the Galaxy: Awesome Mix Vol. 2 by Various Artists.